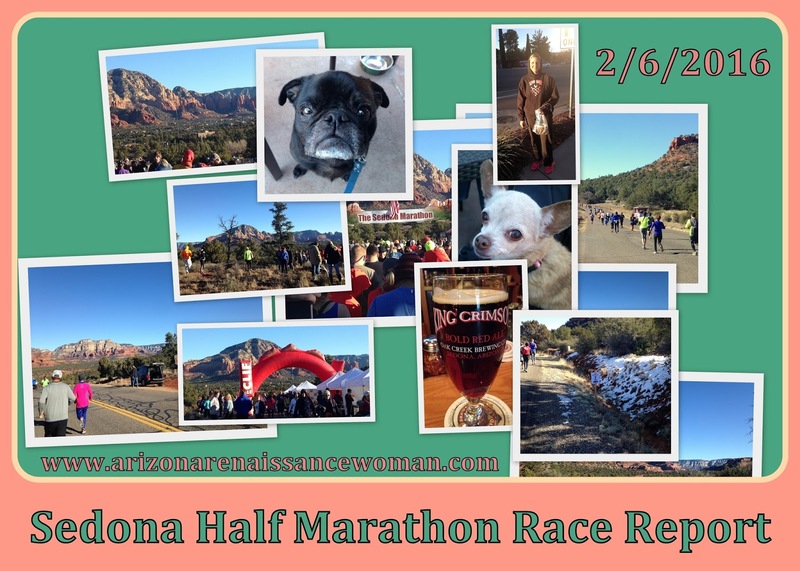 Arizona Renaissance Woman: Sedona Half Marathon Race Report - Up and Down and Up and Down! Sedona Half Marathon Race Report - Up and Down and Up and Down! A little over a week ago, I had a fabulous weekend in Sedona as I participated in the Sedona Marathon Event for the first time. I ran the half marathon - I had originally signed up to the the full marathon, but my training just wasn't where it needed to be. I hadn't gotten in enough REALLY long runs. I'd done a 16.75, but no eighteens or twenties. After four full marathons (two properly trained and two a bit undertrained), I knew what I would be in for. Pain. And no fun. About three weeks before the race, I saw the writing on the wall and decided to switch distances. (Three weeks out, you're about as trained as you're going to be and I know that!) This was the first time I had done that. After experiencing the difficulty of the half, I'm sure that I made the right decision! I'm not sure why I had so much trouble with the training this time around. My body didn't want to do it. My mind was . . . bored. I don't know. I guess I'm in a bit of a running rut. Well, if you're in a running rut, a race in Sedona is some good medicine! It's challenging (no joke), and the scenery can't be beat! It was an out-and-back course. It goes up. And down. And up. And down. Am I sounding like a broken record yet? It was rarely flat. It has an uphill finish! I knew it would be uphill, but when I finally got to the last bit of it, it seemed so unfair. Ha ha. I ran another half marathon (the Groom Creek Classic) back in September and I thought this one would be a piece of cake in comparison. The Groom Creek race was at 6,000 feet elevation and the hills were even more intense. Well . . . I was able to pull off a better time in Sedona, but I definitely wouldn't call it cake. I got a nice black sweatshirt with a "DIRTRAG" logo. What is that, even? I guess I thought I was being edgy and subversive? I don't know. I also got a faded Eddie Bauer thermal shirt. I was ready! Look at this scenery. Wow! We're all up on a hill trying to find a spot in the sun! 47 states were represented in this event! Not bad, considering that there were only 2000+ runners participating (all race distances). I was able to stand in the sunshine while I waited for the race to start and I wasn't as cold as I thought I would be. I ended up putting the sweatshirt in my gear bag and checking it. Yep. I got to keep the Dirtrag sweatshirt. Awesome! I tossed the thermal shirt at about mile 3. There were people in shorts at the start, but I wasn't one of them. I don't like to be cold. Those central Arizona temps keep my blood thin! Seven miles down - yay! Look, there was snow in the shade! Overall, I hung in there pretty well. I definitely had to get strategic with the hills, especially during the second half. I walked the worst ones. And some of the small ones. My plan worked, as I was able to pull off ten minute miles even with some walk breaks! This is neither my best nor my worst half marathon time. 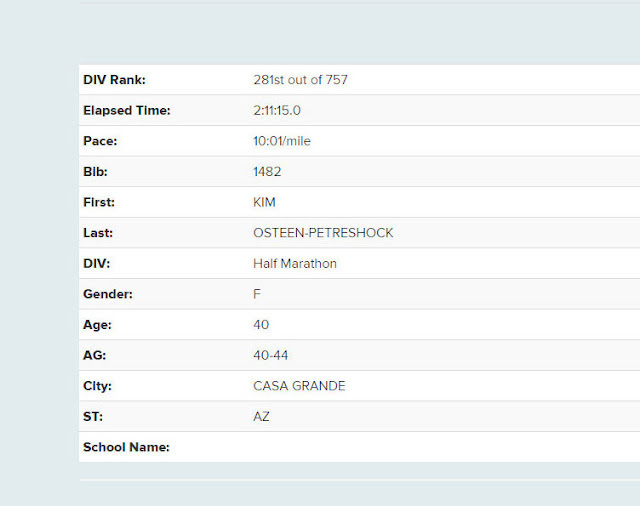 My personal best was the Casa Grande Half Marathon in 2014 (1:54 and some seconds). That, however, was an easy course - fast and flat! I'm more than OK with my time for this race. I had a good time. I gave it my all. I usually run on coffee and an empty stomach, which was probably not a good call for a tough race like this. I may or may not have been so wiped out afterward that I sat on a curb and deliriously ate a cookie while I wondered how I would make it back to our hotel. The shuttle bus. Right. The brain can only be expected to work at half-speed during such circumstances. Diego likes to alternately nod off and stare at me when we're on vacation. Frida's almost 14 and up for anything! We just HAD to stop at Oak Creek Brewing. Unfortunately, at about 1:30 pm, we realized that every other runner had the same plan, so we went back later for dinner! We had a good time. I'm so glad I switched to the half! I think I've got a few more marathons in me, but this just wasn't the time. Sometimes I just . . . don't want to go for a long run. I want to hike. Or cook something. Or . . . you know??? Sigh. Overall, I would highly recommend this race - it's small, challenging, and the scenery can't be beat! I never got the feeling that Sedona was overrun with runners, either. I think they were able to absorb the extra people pretty successfully. Please feel free to comment! Have you participated in this race? What did you think? Have you ever changed race distances? How did you feel about that?